Shopping for a new vehicle can be a very stressful and costly endeavor for customers. The team at Sullivan Motors is doing its best to offer customers with special savings and promotions to ease the stress placed on car buyers. Sullivan Motors understands that car shopping often does not go as smoothly for customers as many would like. Due to this issue, Sullivan Motors is running special pricing on select new vehicles to make the car-buying process easier on customers stress level and pocketbooks. Sullivan Motors have several new vehicle specials for customers to explore at the dealership. One vehicle that is featured in multiple specials is the 2018 Buick Regal Sportback. When customers finance through GM Financial, they can receive $1000 off the sales price as part of the GM Down Payment Assistance Program. 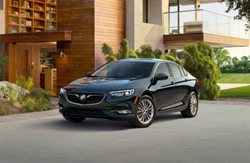 Additionally, customers can receive $500 with the purchase of select 2018 Buick Regal Sportback models as part of the dealership’s Consumer Cash Program. These two specials will be available through the end of October. Interested customers should contact the dealership directly for more information. To clear space for incoming 2018 and 2019 vehicles, Sullivan Motors is also running special discounted pricing on all its remaining 2017 models. Sullivan Motors is offering invoice pricing minus rebates on all their 2017 models. The dealership will consider all reasonable offers from customers. 2017 models currently on the lot include Buick LaCrosse, Chevrolet Cruze, and GMC Sierra 1500. Customers are encouraged to contact the dealership before arriving to ensure these vehicles are still available. Customers who are interested in obtaining more details concerning the new vehicle specials offered at Sullivan Motors should contact the dealership directly. The dealership can be reached by phone at 601-921-4629 or online at sullivanmotorsusa.com. Sullivan Motors is located at 3114 Highway 49 in Collins.